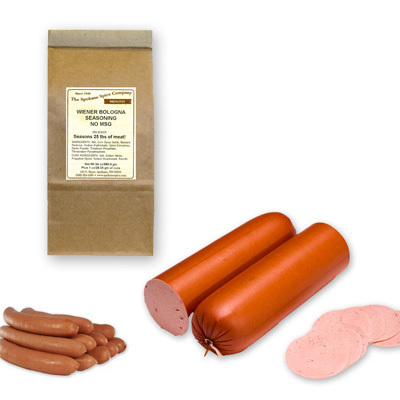 A popular Wiener Bologna Seasoning. Works well with beef, pork, poultry, venison or any blend of meats. This seasoning makes an old fashioned, meaty and flavorful Ring Bologna, Bologna chubs or wiener links. NO MSG! Ingredients: Salt, Corn Syrup Solids, Mustard, Dextrose, Sodium Erythorbate, Spice Extractives, Garlic Powder, Tricalcium Phosphate, Tetrasodium Pyrophosphate.